Low Carb High Protein Dinner Ideas: 10 Recipes to Make You Feel Full! Dinner is my favorite meal of the day. Some people love breakfast and others are brunch fanatics, but dinner has always been (and will always be) my favorite. I think it has something to do with the fact that dinner is usually a family meal. When I was younger, even if we had to run out the door for a dance class or hockey game, we always had dinner as a family. And as I’ve gotten older I’ve realized how important it is to think up low carb high protein dinner ideas night after night, whether you’re off to an activity or not. The last thing you want is to feel hungry before you go to bed. Bedtime snacking can lead to unhealthy habits and even weight gain. The best way to curb the pre-sleep munchies is to eat a meal for dinner that keeps you nice and full. Dinners that are high in protein will keep you satisfied through the night, plus meals that are both high protein and low carb are the best way to slim down while also still enjoying good food. 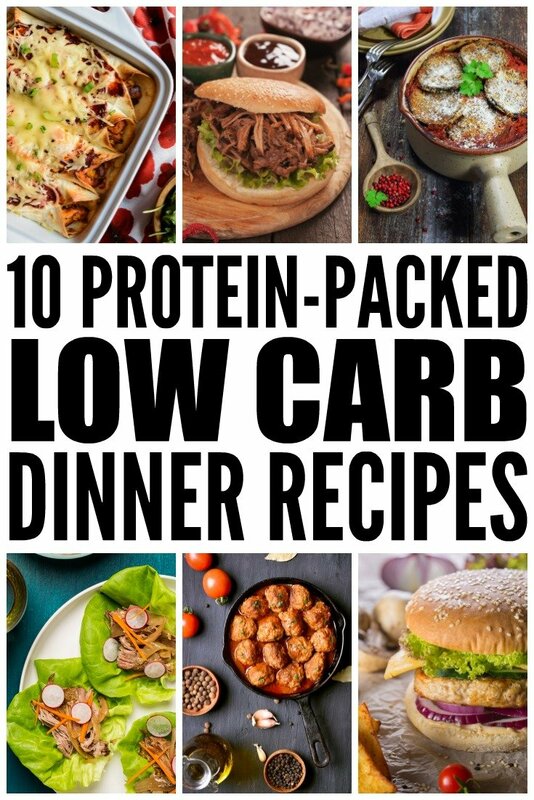 If you’re looking for some yummy dinner recipes to put on the table, that are just as satisfying as they are delicious, check out these 10 low carb high protein dinner ideas to make you feel full! Over the past few years I’ve developed a strong taste for cauliflower. Not so much cauliflower on its own, but when it’s mixed into something like a chicken pot pie, what could be better? These pot pies are so delicious you won’t even realize they’re low cal, but you’ll reap all the good-for-you benefits! With lots of protein from the chicken, they’ll keep you satisfied all night. These turkey burgers are packed with protein, and mixed with healthy benefits from onions, parsley, garlic and more, you’re sure to feel satisfied with this low-calorie meal. Add a side of cucumber salad, with tomatoes, green onions, sea salt and lime, and you have a fresh way to compliment your burgers. It’s the perfect meal to make on the barbeque and eat outside on a warm night. A great way to cut down on carbs is switching glutinous pasta for zucchini noodles in your lasagna! This recipe is loaded with veggies so it’s a really healthy dinner option that everyone from your kids to your husband will love! You won’t even miss the pasta it tastes so delicious! You may think soup doesn’t qualify as an entire meal, but when it’s packed with ingredients like mushrooms, bell peppers, tomatoes, onions and protein-rich chicken, you’ll be more than satisfied. Soup is one of my favorite things to end my day with. It makes me feel so relaxed and warm inside! And with some zesty taco seasoning, make this one when you’re in the mood for some Mexican flair. Eggplant parmesan (or melanzane alla parmigiana di nuovo) is a classic Italian dish that’s oh-so-tasty. If you’re a fan of eggplant, this is one recipe that needs to be in your recipe arsenal to whip up in the regular. It’s super healthy and quick to make, so it’s perfect when you have a busy night. The way she prepares it is lighter with a crispier touch so it’s filling but not overly indulgent. There’s nothing like slow cooked BBQ pulled pork that melts in your mouth! The great thing about slow cooking is you can prepare the food throughout the day so it’s ready for you and your family when you step through the door. Sure, it may take time to prepare, but the end result will be so worth it and it will keep you satisfied through the night! And with a bunch of healthy herbs and spices, you can feel extra good about indulging in this meal! A healthy version of buffalo chicken wings, these meatballs are oven baked so they’re so much better for you! With ingredients like coconut flour, celery, pink sea salt, and onion powder, among others, these meatballs will quickly become a dinnertime favorite and they’ll keep you full and satisfied without the carbs! I’m drooling thinking about this pork filling flavored with spices, ginger, mint and black bean sauce. Stuff it in an eggplant and I think it’s about to become my go-to dinner recipe. I’m actually not a huge fan of pork, but this recipe can also be made with beef or ground turkey – just keep the seasoning the same! Eggplant tastes so delicious mixed with Asian flavors, plus they’re perfect for stuffing! This is low carb comfort food at its finest! This is a great vegetarian option for anyone who doesn’t eat meat or for the nights when you’re just not feeling it. Beans have tons of protein, and so does spinach, which is also packed with vitamins and essential nutrients. Plus, you can add in the recommended side salad for a fresh and healthy crunch! PF Chang’s chicken lettuce wraps are one of my favorite things to order on their menu, so when I found this copycat recipe, I jumped on the chance to make them at home! With lettuce used for the wraps, you cut down on major carbs, and the chicken gives you a good boost of protein! Plus, you can have them ready on the dinner table in less than 15 minutes! These low carb high protein dinner ideas are perfect for any night of the week. Whip them up for you and your family to stay satisfied, healthy, and beat the pre-bed snacking! If you liked this collection of low carb high protein dinner ideas, please share it on Pinterest! And if you’re looking for more delicious and healthy dinner recipes, please follow our Food and Recipes board on Pinterest!